In this depiction,we see behaviors of effective collaboration within work groups, such as coaching each other, using good practices for brainstorming, the elements of a learning organization, being willing to admit to problems, and being willing to lose if you don’t lose the lesson. At the next level, communities of practice need to continue to evolve their practices, sharing issues and working together to resolve them. Within these communities, sharing pointers as well as deeper thoughts are mechanisms for ‘stealth mentoring‘ and explicit mentoring is valuable as well. 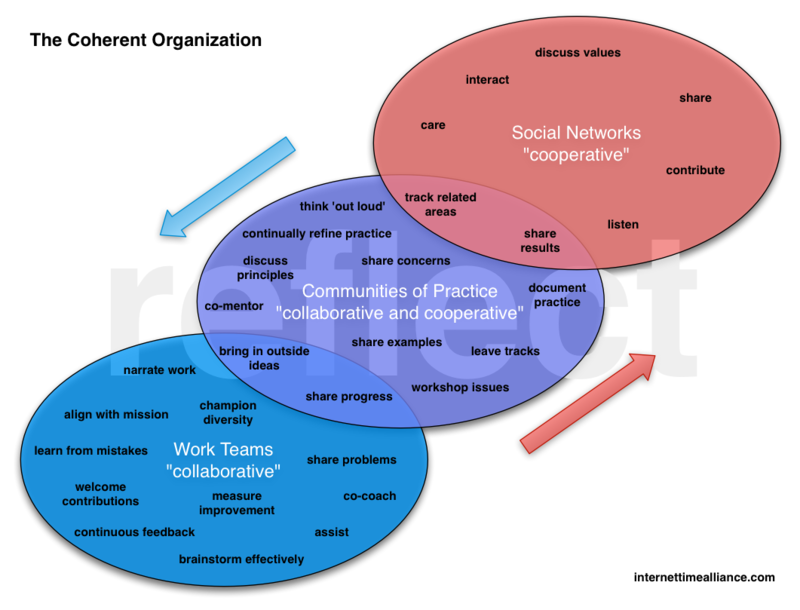 At the outermost level, social networks are about tracking what’s happening and who knows what, looking for developments in related fields as mechanisms for improving designs, and sharing practice is a way to give back to the community. At the intersections, you need practices of both sharing outward and bringing inward, always looking for fresh inspiration and valuable feedback. The transparency provides real value in developing trust among the constituencies. I put reflection underpinning all of these, as a core practice. Reflection is absolutely critical to continual improvement in every area. Note that the firewall tends to cross the middle of the diagram, and by blocking access you’re effectively cutting off a portion of the corporate brain! This should not by any means be considered definitive, as it’s my first draft, but I think it helps (me, at least) think about what practices could accelerate an organization to be both effective and efficient, able to move nimbly to deliver ongoing customer delight by continual innovation while executing as well. We’re thinking about this as the ‘Coherent Organization’, aligning the flows of information, and aligning the work with the organizational goals. As always, I welcome your feedback: what should be added, removed, modified, etc.